Our first glimpses into the physics that exist near the center of a black hole are being made possible using "loop quantum gravity"—a theory that uses quantum mechanics to extend gravitational physics beyond Einstein's theory of general relativity. Loop quantum gravity, originated at Penn State and subsequently developed by a large number of scientists worldwide, is opening up a new paradigm in modern physics. The theory has emerged as a leading candidate to analyze extreme cosmological and astrophysical phenomena in parts of the universe, like black holes, where the equations of general relativity cease to be useful. Previous work in loop quantum gravity that was highly influential in the field analyzed the quantum nature of the Big Bang, and now two new papers by Abhay Ashtekar and Javier Olmedo at Penn State and Parampreet Singh at Louisiana State University extend those results to black hole interiors. The papers appear as "Editors' suggestions" in the journals Physical Review Letters and Physical Review on December 10, 2018 and were also highlighted in a Viewpoint article in the journal Physics. "The best theory of gravity that we have today is general relativity, but it has limitations," said Ashtekar, Evan Pugh Professor of Physics, holder of the Eberly Family Chair in Physics, and director of the Penn State Institute for Gravitation and the Cosmos. "For example, general relativity predicts that there are places in the universe where gravity becomes infinite and space-time simply ends. We refer to these places as 'singularities.' But even Einstein agreed that this limitation of general relativity results from the fact that it ignores quantum mechanics." At the center of a black hole the gravity is so strong that, according to general relativity, space-time becomes so extremely curved that ultimately the curvature becomes infinite. This results in space-time having a jagged edge, beyond which physics no longer exists—the singularity. Another example of a singularity is the Big Bang. Asking what happened before the Big Bang is a meaningless question in general relativity, because space-time ends, and there is no before. But modifications to Einstein's equations that incorporated quantum mechanics through loop quantum gravity allowed researchers to extend physics beyond the Big Bang and make new predictions. The two recent papers have accomplished the same thing for the black hole singularity. "The basis of loop quantum gravity is Einstein's discovery that the geometry of space-time is not just a stage on which cosmological events are acted out, but it is itself a physical entity that can be bent," said Ashtekar. "As a physical entity the geometry of space-time is made up of some fundamental units, just as matter is made up of atoms. These units of geometry—called 'quantum excitations'—are orders of magnitude smaller than we can detect with today's technology, but we have precise quantum equations that predict their behavior, and one of the best places to look for their effects is at the center of a black hole." According to general relativity, at the center of a black hole gravity becomes infinite so everything that goes in, including the information needed for physical calculations, is lost. This leads to the celebrated 'information paradox' that theoretical physicists have been grappling with for over 40 years. However, the quantum corrections of loop quantum gravity allow for a repulsive force that can overwhelm even the strongest pull of classical gravity and therefore physics can continue to exist. This opens an avenue to show in detail that there is no loss of information at the center of a blackhole, which the researchers are now pursuing. 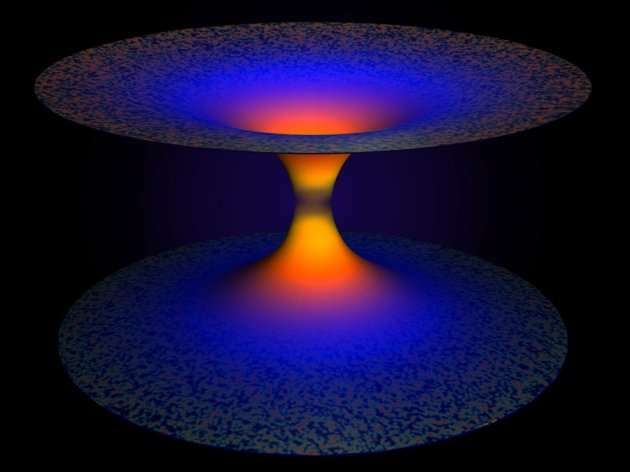 Interestingly, even though loop quantum gravity continues to work where general relativity breaks down—black hole singularities, the Big Bang—its predictions match those of general relativity quite precisely under less extreme circumstances away from the singularity. "It is highly non-trivial to achieve both," said Singh, associate professor of physics at Louisiana State. "Indeed, a number of investigators have explored the quantum nature of the black hole singularity over the past decade, but either the singularity prevailed or the mechanisms that resolved it unleashed unnatural effects. Our new work is free of all such limitations." Probing Question: What happened before the Big Bang? At least they are consistent with naming their theories after phenomenon that cannot be found. "thatgeneral relativity predicts that there are places in the universe where gravity becomes infinite and space-time simply ends. We refer to these as singularities." "The essential result of this investigation is a clear understanding as to why the "Schwarzschild singularities" do not exist in physical reality. Although the theory given here treats only clusters whose particles move along circular paths it does not seem to be subject to reasonable doubt that most general cases will have analogous results. The "Schwarzschild singularity" does not appear for the reason that matter cannot be concentrated arbitrarily. And this is due to the fact that otherwise the constituting particles would reach the velocity of light." "On Stationary Systems with Spherical Symmetry consisting of many Gravitating Masses"
So Albert Einstein writes this 80 years before today in contradiction to Abhay Ashtekar and Javier Olmedo. I guess they have just never bothered to check first to see if Einstein ever proferred their opinion that general relativity predicts that: "there are places in the universe where gravity becomes infinite and space-time simply ends".........Einstein never proferred their vision of SINGULARITIES & he wrote his 1939 paper intending to dispel such violations of the Laws of Gravity & the Inverse Square Law & the fact gravity is MASS dependent not DENSITY dependent. Duh... The more mass you have in a denser packed space, the more gravity you have. And yet where do you see numbers? Clearly there is pragmatics to all this counting nonsense? Even without the integers, what would the proposition of science be, I predict uncertainty. Disruptions of homogeneous substances, that are created and destroyed for a conserved noise, to save the sanity of invariance. We are crazy, but there can be a method to madness. Even a madness "Against Method". "Science is essentially an anarchic enterprise: theoretical anarchism is more humanitarian and more likely to encourage progress than its law-and-order alternatives." It seems whether by intrinsic principle or by a distribution, if we are to progress, it is with both avenues. Angles, amplitudes, and shadows upon the wall of topos. Cohomolgy and covariance, auxiliaries open. QED with QCD, Dirac and spacetime operators. What dichotomy? Whose null? the more mass you have in a denser packed space, the more gravity you have. .....ONLY if additional MASS is ADDED to the volume. If MASS remains CONSTANT within a volume the gravity field of the body will remain constant, it won't matter what VOLUME THAT MASS may shrink to, gravitational attraction of that body will remain the same, and you can't FALSIFY that Immutable Law of Physics, although you can go on name calling rants about it. You're just too caught up in 19th Century TUGMath BH Calculations not realizing almost all of that century's cosmology was wholly inaccurate. We're now almost two centuries beyond BH TUGMath, thank you Albert Einstein, and no thank you present day Pop-Cosmology that would keep us there. As you and Benni are consistent in your ignorance and obnoxiousness. Hey, got any new dances for us, or just a continuance of the same old ones? See that r²? That's distance from the center. M is the mass of a planet, m is your mass. G is the gravitational constant. Now, if r gets smaller, what happens to F? F is force, just as above. Q and Q' are two charges. k is Coulomb's constant, for electric charge. And d is the distance between the charges. Note that this is essentially the same equation, with charge instead of mass, and Coulomb's constant instead of the gravitational constant. Just like gravity, the electric force spreads out, and the force declines as the square of the distance; it's an inverse square law, just like gravity. You seem fine with that. So what's your problem with understanding how gravity works? It works just like EM, except on charges instead of masses, and that's a fact experimentally determined in laboratories. This is pretty simple physics. One little equation, and both gravity and EM are covered. We can find the force we expect to see based on charges/masses, and on distance. All we need is the two constants. Both, obviously, are well-known. They've been measured in labs for centuries. But until we get past this, there's no way to talk about anything deeper. Now, getting back to the article, this is all very well, but it appears that LQG can't make quantitative predictions that can be verified any more than string physics can. So how come we keep having to listen to the endless whining about how string physics doesn't make any predictions, particularly after AdS/CFT correspondence has, in fact, made predictions that have been verified? You are cheating, Da Schneib. You are introducing science into a discussion with a scientifically illiterate moron. Not fair! But if it falsiable after all... Of modern day theoretical physics, the most common example seems to be string theory; and even there have been found more and more limits what cannot match with the university we are dealing with. .....and how can F ever equal infinity no matter what the distance is between the two objects? I'll bet you thought r² had something to do with RADIUS, right? "that general relativity predicts that there are places in the universe where gravity becomes infinite and space-time simply ends. We refer to these as singularities." .........and which of course Einstein denies can ever happen based on his paper "On Stationary Systems with Spherical Symmetry consisting of many Gravitating Masses". So why are you Pop-Cosmology guys smarter than Einstein? So explain to us how shortening the distance between two objects creates INFINITE gravity at zero distance "r"? That would simply be the point where the two centers of MASS coincide & two now become one. As I understand it, gravity is strongest at the surface of a planet while compression is the highest at the center. Why should a black hole be any different? It's still just matter/energy being compressed due to gravity. Why should its gravity be strongest at the center? That doesn't make sense. Answer the question. Until you do we will go no further. You are right on that particular point. However, shrinking the volume increases the amount of gravity at the surface in any given area. Therefore expressed (using the ISL correctly) outward per given area. LOL! jonesdumb doesn't understand da schnied's explanation solves his "stars orbiting BH" riddle. Those are charges orbiting in an electric field jonesdumb, using the dastardly inverse square law. It should also be acknowledged that little tidbit suggests gravity is but a property of EM, as Maxwell suggested nearly 200 years ago. @24volts, remember the shell theorem. In other words, in those places where no-one can produce a testable hypothesis, loop quantum gravity can't be falsified. Like all other string derived theory, Loop Quantum Gravity is founded souly on wishful thinking expressed mathematically. LQG isn't "string derived theory." Not to mention AdS/CFT correspondence. Which is string physics that has made predictions that have turned out correct. LQG has never done that. I did, how did you miss: "That would simply be the point where the two centers of MASS coincide & two now become one." You didn't. The correct answer is obvious from the equations and you don't care to admit it. Until you do this discussion will go no farther. Period. .......right on all of them, take a 1st semester physics course. However, shrinking the volume increases the amount of gravity at the surface in any given area. ........ "area"? So what? TOTAL GRAVITY does cannot change because no MASS has been added! Look above, I had to do the same for schneibo too......F=ma, nothing in there about changing the density of a MASS to change it's TOTAL force of gravity, it's the MASS that must be changed not reducing it's VOLUME. Look at the equation, where in F=ma do you see anything about VOLUME functioning as a variable? Yeah, there's no point in going further when YOU got yourself caught up in a conundrum of misreading the equation in the first place, thinking it meant one thing only to be corrected by me that it wasn't what you thought, but, typical math mis-steps Pop-Cosmology aficionados make here all the time. Answer the question. What does F do when r (or d) decreases? And it works to get spacecraft to Pluto. ....... F=ma is apparently much too complicated for you, it's really very simple that when the distance between two centers of mass become zero, their masses simply becomes additive & gravity is calculated by F=ma. Do you have some funny farm math concept for calculating gravity when the distance between two bodies is otherwise computed to be so close that the distance is otherwise indescernible & the two masses simply become additive? I got puzzled recently...yeah that ain't hard to do, I know...when I purchased a book on QG which includes some LQG;suddenly some 'constant' (or an operator) appears, for which I've found no reason (in the book) for its inclusion. (It wouldn't be right for me to mention names here). The other thing that makes wonder is the use of Heisenberg's UP for a particle close to the EH of a BH. Now, I don't know if that is valid or not (I am aware of more than one form of HUP) but again it isn't explained what the purpose is. Any ideas? When r decreases, what does F do? You will not get beyond this until you admit the truth. You do realize that there is a maximum to that F ? Picture two bowling balls in space of equal size and mass. As they approach, the force between them reaches a maximum when their centers are 2r apart. It is then that the molecular forces of its matter take over and stop r from reducing further. Therefore, the only way to increase the gravitational force between them is to add mass to the bowling balls. Thus, "r" is limited by other things, that are not listed in Newton's empirical equation for gravity. Whether there is a maximum to F or not is immaterial to what happens to F when r decreases. Lets assume for the purpose of this argument that a radius of zero is never reached. Lets say you cannot put 2 bound objects at 0 distance from each other. As the radius of a static mass goes down the surface gravity must go higher. As the radius approaches 0 the force approaches infinity a the surface. Approaches...this is an asymptote. If radius equaled zero it would not cancel out as you suggest. 1/0 is undefined. 1/0 != 1/1. Even if the singularity is non-physical gravity must become incredibly high at the shrinking surface while gravity at all distances remains unchanged. Your complete misunderstanding of basic math disqualifies you from making any kind of informed opinion on the matter because you are uninformed by choice. What is the physical meaning of gravity produced by m' in the absence of a second mass m'' to act upon? How do we measure such gravity? Both of those equations presume that that space does not change as the density of the mass increases. But to change the density you have to re-arrange the mass and that distorts space, which is why Newton gets replaced by Einstein. Gravity is most probably the result of the statistics of available quantum states. If there are more states available to the left then an object will tend to drift to the left. The number of available states is a function of energy "density" and if we hold the energy density of the vacuum to be constant then the volume of space is proportional to the energy density. When there are no more states available in a particular direction there can be no movement in that direction. Are states always available, irrespective of the scale? If the answer is no then there is no singularity. If the answer is yes, then there is no limit to how much space can be created inside a volume that appears finite in extent by an outside observer. Can gravity be infinite ? Only under conditions where INFINITE MASS exists, but there is no such thing. Total force of Gravity in a system cannot exceed F= mass x acceleration because the force gravity exerts is MASS DEPENDENT. Your moniker of "Enthusiastic Fool" is befitting of this response by you. You & Schneibo are twins, right? @Benni Da Scheib pointed out the equation for the EM force which is also an inverse square law and also allows an undefined (not infinite) force when d goes to zero. I'm not sure why you have an issue with gravity and not the electromagnetic force. Of course we know that d doesn't go to zero. This is rectified by quantum mechanics. Don't you think quantum mechanics will come into play as well for the gravitational force at some point? The article points out that Einsteins equations break down at some point and the theory is incomplete yet you keep on attacking it for it's singularities. Anyhow. It's impressive that you can divide by zero. .......well then, if you think so , PROVE it!!!!! Just FALSIFY that gravity in a defined system is MASS DEPENDENT. ......but they're unable to PROVE it. How about if you PROVE that shrinking an isolated system to a smaller volume of displacement creates NEW TOTAL GRAVITY without adding mass to the system? The fact of the matter you have no such evidence because the face value of the concept is nothing less than PERPETUAL MOTION psycho-babble. @Benni If you shrink the Earth to the size of a pea and stand on the surface of the pea earth the force of gravity will be stronger than standing on the surface of the normal sized earth because your distance from the center is closer to the entire mass. Somebody earlier pointed that out 1/r^2. There is no new total gravity. It's simple math dude. Da Schneib infamous statement "You will not get beyond this until you admit the truth"
BH only exists in singularities? "Enthusiastic Fool:- Let's assume for the purpose of this argument that of zero is never reached"
***There is no new total gravity. It's simple math dude***. Force = Mass x Acceleration............Capiche? Probably you don't. Maybe the Acceleration has you styimied or what? Gee, I thought Newton was "seventeenth century math." This troll will use anything, and then denigrate it, at the whim of a moment. @Benni Guy man dude. By decreasing the volume of a given mass you allow something to get closer to it which increases the gravitational force because of 1/r^2. You are being foolish now. @Benni So you actually disagree with my "pea earth" example. If you can't understand that I can't comment further because you won't understand. By decreasing the volume of a given mass you allow something to get closer to it which increases the gravitational force because of 1/r^2. .........this does not change the TOTAL GRAVITY of a GIVEN MASS. Constant Mass => Constant Gravity............. and you can't FALSIFY this. It is immaterial what the proximity of one mass is to another as affecting individual TOTAL GRAVITY of individual given mass. Go ahead, shrink any mass to any volume you want, just because the concentration of gravity per unit area increases, so what? Are you still looking for INFINITY in here somewhere, I have a hunch that is your goal? @Benni Please point out where I said the TOTAL GRAVITY of a GIVEN MASS changed. You said that. I certainly didn't. You are confusing me with some other poster, perhaps doing it on purpose because you have no argument and are trying to save face. No, I made no such mention that you did, My goal was to pound home the fact that some here do not believe gravity is mass dependent, and to drive a huge wedge between those who do, and those who do not, you were simply a convenient sounding board. Capiche? Hell's bell's man,yours is the "face" I'm trying to save !!! And because I did it. In the meantime the rest of the Pop-Cosmology aficionados living here have gotten so jacked out of shape because they can't find a way to INFINITE GRAVITY. Black Holes are the holy grail of Pop-Cosmology & it needs INFINITE GRAVITY to get to their INFINITE DENSITY Singularity. @Benni confuses "gravity" with the force of gravity at a given point. What I do get is that YOU want to make r² zero & fictitiously divide it into a whole real number for the sole purpose creating unreal infinite energy. @Benni, nobody said anything about making r = 0. That's something you invented. The same way you always lie about what people said. And the reason nobody likes you except other trolls is because you do that. I don't believe he really said that. He was smart. It's the nonsense part I and, I think, Popper would disagree with. It doesn't have to be science to be worthy of study and it would be foolish to denigrate something that is non-science just because it's non-science. Let Freedom Ring! The smallest radius r, can shrink in the vacuum with mass m! I agree; I think what Popper said isn't about what can't be falsified right now, but about what can never be falsified. And there is a big difference. @Benni, nobody said anything about making r = 0. That's something you invented. The same way you always lie about what people said. And the reason nobody likes you except other trolls is because you do that. The ONLY reason Pop-Cosmology trolls like you don't like someone well educated in the physical sciences is because I'm an impediment to the spread of the Perpetual Motion psycho-babble people such as you like to engage in. For example, you can't FALSIFY the immutable: CONSTANT MASS => CONSTANT GRAVITY. Nothing galls YOU more than to come up against someone who has the writing skills for showing the illogical reasoning of any concept to the contrary. To me, you're just a toy that's fun to play off against, a way I have for entertaining myself for a few minutes everyday just for some light hearted fun, all the while exposing readers to the purveyance of the Perpetual Motion psycho-babble that goes on here in the name of Pop-Cosmology. "@Benni If you shrink the Earth to the size of a pea and stand on the surface of the pea earth the force of gravity will be stronger than standing on the surface of the normal sized earth"
No, YOU are the one who said "gravity will be stronger". Caught you changing your earlier Comment when you were challenging me for an answer for when "r" equals zero? You erroneously thought I wouldn't notice, right? I've known for a long time WHAT you are here, and it ain't just being a casual drop by. Moderators should avoid trying to drive the focus of the chatroom to a specific bias, and you're just not skilled enough to do it. Nope, not a mod. If I were you would have been outta here long ago. I think @LenniTheLiarAndButthurtPlagiarist is trolling again. It will use anything, including imitating paranoid psychosis, to get its way, even if it denies math. I see you're on this as well SEU. The Physorg Moderator (Da Schneib) went back & changed a number of Comments in followup to this article, his own, mine, and jimmybobber. I tracked at least five Comments that were changed with no notification from Physorg that the Moderator had changed the content of individual Comments. I started noticing over a year ago that Da Schneib was challenging me to PROVE he made Comments I attributed to him. I kept the dates of a few of those Comments he made, I went back after he posted his challenges to prove he made the statements I attributed to him, but they were missing, yeah, they had been deleted from the chatroom site, only a site Moderator at Pyhsorg can do that. This current thread is pervasive with Site Moderator changes, Da Schneib being the Moderator. Continuing from above, Physorg Moderator (Da Schneib). The fact that Physorg's own Moderator (Da Schneib) is the lead Moderator for this chatroom explains why the Report Abuse does not effect any results, it's because Da Schneib is the lead Moderator on the reception end of those complaints, and of course if any are about him it gets dropped because he's the one doing it. Over in another thread Stumpy tried offerring advice about System32 hacking, ignore it or risk damage to your OS. @Benni Nobody is changing my comments. I made a modification to one within the few minute time frame to fix a spelling error. That is all. You do realize you can edit a comment for a few minutes after you post it? ^ This is a comment edit. No, it was changed well beyond the 3 minute limit, you either have yet to pick up on it or you just don't care, and most probably in your case, both. @Benni which comment did he change of mine? I just looked at all my comments on this article and they are as I typed them. .....then you don't care, so I was right it was "both". @Benni I do care. None have my comments have been changed. Keep me out of your lies please. ......."lies"? Prove it. Or maybe Da Schneib the site Moderator can? How about about it Schneibo, care to help jimbo out with some memory recall? @Benni You said that my comments have been changed by a moderator. I told you my comments have not been changed. You lied and worse you included me in your lie. If a moderator feels that changing the user's expression is warranted (e.g. removing some inappropriate text), the action should be logged by a thread in the Forum Issues forum. The post there should contain a complete copy of the user's original message as well as showing what changes the moderator made. In such cases, rather than editing the post, it may be better to simply flag (report) the post, or to move the whole post intact to Quarantine, so that other moderators can help decide the best course. Read, read, schniebo. Did you as a Physorg Moderator do any of the above? Or do you just want to carry on here as a despicable liar that you have never engaged in CHANGING the contents of postings, and in some cases eliminating them without due process of notice of change including your own? You do comprehend what I am trying to do here don't you schneibo? Ok, if you don't. I'll digress a bit. I'm knocking myself out badgering you at Physorg to delete my account, while In the meantime making it clear to the rest of the chatroom why at a sudden point in time they read no more Benni, what happened to him? In followup to your deletion of my account, I'll be back under another moniker, and after a few postings under the new moniker, I'll identify myself as the former Benni whose account was deleted because he caught one of Physorg's Moderators purveying in so much foul mouthed filth that he was embarrassing all but the same few who would 5 Star him for any manner of his foul mouthed filth. I believe that, Benni. I recall reading some comments made by Captain Skunky and Da Scheide (Da Schneibo) that one or both of them had contacted/emailed someone at, I presume, Physorg Hdqrtrs to request that Da Scheide be given the unpaid job of Moderator - and that he was willing to do the job without pay. Of course, it is easy to see in all this time that many of Da Scheide's self-aggrandising comments do offer evidence that Da Scheide has certain mental issues which cause him to look up math equations in sites such as Quora so that he can present that same information in THIS site and that his cheering squad should heap praise on him. I see that Whyde and several others have succumbed to Da Scheide's snake-like charm. But that is THEIR CHOICE, no matter that they are contributing to Da Scheide's very profound mental issues - those issues whose names I have been searching for. I may have to consult some books at University medical library to find what such delusions are called. A big thanks to theghostofotto1923 (SpookyOtto) for providing Da Scheide's moniker, as that title is most appropriate. YOU, as a nonscientist, and a mere scholar of the sciences, seem to be taking sides against Benni, whom you don't personally know. Why? Is Da Scheide so much more appealing even though he is a LIAR? .......because to him it's easier than having a real discussion about REAL science, after all, Pop-Cosmology is fun, he doesn't need to think & he's off into some kind of nirvana out in some vapid wasteland where his favorite Physorg Moderator lives on that plantation of funny farm psycho-babble. Something I've done a few times now is to Report my own Comments, that way you know Physorg's other Moderators, other than just Moderator Da Schneib, may be getting filled in as to what's going on in this chatroom, that Moderators are not logging CHANGED COMMENTS in accordance with standard guidance & practice that I posted above. Those other Physorg Moderators are probably scratching their heads wondering why someone would Report their own Comments. For example, just as soon as I submit this Comment, I'm going to followup with a Report. on it. I did send email over to Science X with regard to this issue, we'll see if any of those brave & wondrous souls care anything at all about what goes on with their Moderators, maybe they're just more concerned with ad revenue like Zuckerberg is. OK, gotta go, Merry Christmas. No matter the size of the Earth, the Gravity at its SURFACE can neither increase nor decrease as that gravity is commensurate to the Earth's size/proportion at the flat surface. In an asteroid hit at the flat surface, the extra volume/weight will not add any additional gravity at that surface. However, the velocity/acceleration/energy of the infalling/free-falling body gives extra weight temporarily to that body until it contacts with the flat surface when gravity becomes normal again. Pathetic. It makes me wonder if all of the weirdos on here aren't just additional personalities that Benni has created accounts for. I'm getting a strong "Split" vibe from him. Bo, not only does my SCIENCE far exceed anything you know, but I'm sure I can dance better than you as well. It's what happens when website administrators allow their Moderators like Da Schneib edit Comment posts made in this chatroom. If you don't like it that others have been noticing Da Schnieb's missing Comments, and those of others, then do what I'm doing to put a stop to the practice. Of course if you think it's OK, then unlike me,do nothing.
. However, the velocity/acceleration/energy of the infalling/free-falling body gives extra weight temporarily to that body until it contacts with the flat surface when gravity becomes normal again. SEU... If it adds mass, it adds gravity. If it adds enuff surface area, it will decrease surface gravity, but not total gravity. Some folks don't have much to say about gravity of any kind at all and are trying to distract attention from that. I have a Bacon Number of 4: I've had drinks with Dawn Wells (she's every bit as sweet in person as she was in character as Mary Ann, Gilligan's Island but a whole lot sharper) who was in The New Interns with George Segal who was in To Die For with Wayne Knight who was in JFK with Kevin Bacon. Ms. Wells has other Bacon #3's but doesn't get any closer than that. Edit: OHNOES EDITING MOD GESTAPO lol dude get a grip DaS is not das mod. This whole thing is ridiculous. So tell us o'master of the blowtorch, What is the force of TOTAL GRAVITY on the surface of a black hole? How about at it's center? If you come back with INFINITE, the next question I'll ask you is how can a single stellar body contain ALL the gravity that exists in the Universe? Maybe there's a Physorg Moderator in the room who can explain it? None of these individuals have any idea what "total gravity" even means. They can't do enough math to differentiate it from "the force of gravity." "what is the force of total gravity on the surface of a black hole?" That is nonsense Benni. It's gibberish. What the hell are you even asking? Do you even know? "The force of total gravity" WTF man. Well of course it's "nonsense", just my point. How is it you recognized the absurdity of the question, but you're unable to comprehend that infinite gravity cannot exist at the surface of a finite stellar mass? You don't think that's absurd do you? What I'm not understanding is this hostile arguing. "Black holes" and "infinity gravity" aren't actually things in the physical universe, they're science kludges not holy writ. We don't yet have the math and physics to fully describe the objects in question, so placeholders are used to give them form we can at least wrap our brains around. We *know* they're there, but we don't *yet* know how to explain them, so these terms are used to at least describe what's happening *around* them since we can't see them directly much less inside them, to describe phenomenon that occur near them due to their presence. It's the same with dark matter and dark energy. Those aren't *actually* things, they're just placeholder names given to phenomenon we don't understand yet. This hostile arguing is really silly, over dumb words for god's sake. @Benni Explain what you mean by "Total Gravity"? When you say "Total Gravity" and something like "Total Gravity doesn't change: I instantly think of Gauss's Law for Gravity. "The gravitational flux through any closed surface is proportional to the enclosed mass." This means your really talking about the "Total Mass" of something. Seems to me you are mixing up total mass and gravitation force(which varies based on the distance between two objects that have mass. Closer the masses, stronger the gravitational force. As for infinity. You already know my view on that. General Relativity is not complete. It doesn't factor in Quantum Physics. There is no infinity. We just don't know how to describe what happens in a black hole yet. You do realize that Mathematics is a tool and equations don't tell us "what something is." Do you even realize that? There are limitations. An analogy: We are a temporarily blinded matador who has never seen a bull before. We know they exist, we can feel their presence, and we know we can master them if we work hard at it. Black holes, dark matter and the like are the bull's horns. They don't fully describe the creature, but give us something to grab onto to while we wrestle with the rest of it. Arguing over the terms is like arguing we're grabbing the wrong color horn and therefore the whole endeavor is bunk. The horn isn't the whole creature, and whatever color you're calling the horn is meaningless since we can't really see it yet, we know only that it is there. We can hear the creature, taste the dust in the air it kicks up. The phenomenon around the beast give us more data. It's all just placeholders until we get enough data to really start to understand the beast. @DRoseDARs Benni doesn't believe in the bull or it's horns. Well the bull believes in him. El Torro loves him. El Torro loves us all. Those aren't *actually* things, they're just placeholder names given to phenomenon we don't understand yet. The reason for the "hostile arguing" is because popular Cosmology keeps trying to spin narratives that known immutable laws of physics in a finite universe are not immutable, that our college textbooks are WRONG, that there is an alternative science beyond a finite Universe. Benni Explain what you mean by "Total Gravity"? Constant Mass => Constant Gravity...........an absurdity to black hole enthusiasts. We just don't know how to describe what happens in a black hole yet. .......then look at a picture of one & maybe you could be on track to find out? Oh, that's right, there are no observations of a BH by which a pic can be made. Well, back to the drawing board isn't it? Explain this to Physorg's Moderator Da Schneib, schneibo. He's the one who pushes 19th Century TUG Math as his basis for the formation of BHs. .....and all you believe in is the bull. @Benni What do you mean by "Constant Gravity?" Depending on the configuration of a "constant mass" the gravitational force may vary because the space time around it may be bent differently. You don't comprehend even one word of what you just wrote. The reason you put up such obscurity is because you are using weasel words to create a narrative for infinite gravity at the surface & center of a black hole, a complete violation of the Inverse Square Law for gravity. It's obvious you're another of those living in the fantasyland of Pop-Cosmology where the Inverse Square Law of zero gravity at the center of a certain kind of stellar mass doesn't exist, BHs, just like the author of this article who doesn't believe it. You obviously don't believe gravity is MASS DEPENDENT, so you are expending a lot of semantics here trying to create illusions that a CONSTANT unchanging mass squeezed into a smaller volume ADDS new gravity to a stellar mass body, right? @Benni Of course the force of gravity is mass dependent F = GMm/r² and the force of gravity between two masses is also is dependent on the distance between them. What do you not understand about F = GMm/r² ? It's a simple formula. Lets say M = mass of earth. m = mass of you. r = radius of earth. Now let's say we shrink the size of the earth such that the radius is r/2 but the same mass. Then if you stand on the surface your at r/2 the force of gravity is F = 4*GMm/r^2 where r is the original radius of the earth. The force is 4 times larger. No extra mass, no extra "total gravity." Benni gets it. He just wants to word play. "How do you pop-cosmologists explain an INFINITE DENSITY on a FINITE stellar MASS??" What do you not understand about F = GMm/r² ? I see your math problem, you think r² in the denominator is the radius of the earth. It isn't, it's the distance between the centers of mass of the two objects. When r² becomes zero as I have explained previously to YOU & schneibo, the equation reduces to F=ma from which the force of gravity of a single mass body is calculated. Can you do that on your own or do do need assistance? @Benni "r^2" isn't the radius of the earth. "r" is. My example was a very simple demonstration of how the force of gravity increases as objects with mass get closer to one another. I did assume r (radius of the earth) was also the distance between the center of masses to make it easier to calculate. I could have easily done the same with point particles. No idea what you mean by saying F = GMm/r² reduces to F=MA when r goes to zero. F = ma = GMm/r² gives a = GM/r^2. I hope you realize the acceleration due to gravity of the earth at 9.8 m/s varies with r. 9.8 m/s is the acceleration on the surface of the earth. .........of course you don't understand, that's what I've been telling you, and because you don't understand that when the distance (r²) between two centers of mass become zero that r² goes to zero & drops out of the equation & the calculation for the force of gravity becomes F= mass x acceleration because you are now calculating gravity for a SINGLE BODY, not two bodies. Jesus, the stupid here hurts! Stick to mopping, you uneducated loon. @Benni "r^2 goes to zero and drops out of the equation"
That statement makes no sense at all. g(r) = GM/r^2 which is the gravitational field strength at distance r, where M is the combined mass. The units would be Newtons/Kilogram. There would be no force until another object with mass (m) entered the field of mass M.
Still have no idea what you mean by the force of gravity becomes f=ma. .....there is no distance r after the two bodies merge & coincide at the center of gravity, it's the reason r² drops out of the equation, because there is now ONLY A SINGLE MASS BODY due to the merge for which to calculate the force of gravity using F=mass x acceleration. ......simply because two bodies have merged into a single body, this is a single body equation, you know, once there were two & the two merged into one. F=ma in the earths gravitational field is not a single body equation. "m" is the second body! The earth being the first. On the earths surface we us F=mg where g is 9.8m/s^2 because it's a simple approximation when a mass "m" is near the surface. Now I understand why you can't seem to get anything on this site. You literally think F=mg everywhere in the earths gravitational field and never changes. What happens when r is reduced? So much for "total gravity." "Total mass" is what it works out to. That's a vast simplification, of course, as anyone who knows Special Relativity Theory knows, but it's close enough to get spacecraft to Pluto. ..... Now you're changing the argument, and sure it's a single body equation, the "m" being the single body on which Earth;s gravity is exerting it's Force. The "total gravity" is the total mass/energy. It's the change in gravitational force between two bodies over distance. Its the formula for determining the amount of gravitational force that would be exerted by any body on any other body at any fixed given distance at any point in time. Whyguy did you need to use so many more words that are less concise as a descriptor of the equation? "..... Now you're changing the argument, and sure it's a single body equation, the "m" being the single body on which Earth;s gravity is exerting it's Force." You do realize if the Earth is exerting a force on a mass that is not a single body equation. You do realize that the "single body" exerts a force on the Earth as well. This is all described by F = GMm/r² where M = mass of Earth and m = mass of "single body"
@Benni You don't even understand basic Newtonian gravity and yet here you are in a forum pontificating about a black hole singularity. Note his refusal to accept any other belief than his own in that same thread, even when called out for his faux pas? I told it this years ago, but all I ever got back was a bunch of spew about how I was "stuck on TUG" (TUG is the Theory of Universal Gravitation, Newton's theory of gravity). It claims it's "seventeenth century gravity" despite the fact it allowed Halley to predict the spectacular return of Halley's Comet. .......keep reading my Comments & you will continue the learning process instead of finding it necessary to repeatedly going back to the drawing board to reframe fallacious arguments in trying to convince us that you didn't say what you said, and that what you said is not what you meant. jimmybobber> @Benni Of course the force of gravity is mass dependent F = GMm/r² and the force of gravity between two masses is also is dependent on the distance between them. @Granville You do realize that F = GMm/(r/2)^2 = GMm/(r^2/4) = 4GM/r^2 don't you? It's basic f'n algebra. Good grief. Sorry 4GMm/r^2 i forgot little m.
and "r^2 =0 so it drops out of the equation." I was hoping though to see someone ask / answer: Can r < 1? If so, is it describing something that eternally collapses toward 0? I can't imagine a universe composed of fractals really caring much about Euler. jimmybobber> Sorry 4GMm/r^2 i forgot little m.
When are you gonna learn how to write equations? If you don't believe me plug in some numbers and verify it. Here is some helpful links so you can learn basic math. Let's get this straight, you're giving lectures about learning basic math, in the meantime you don't know how to write a basic equation !!!!!!! @Benni doesn't "believe in" Halley's Comet. Be interesting to see what its opinion is on the Moon landings. Or reptilian telepathic infiltrators of politics. Quote of the year gifted by Granville. Thanks man. it takes the mathematical calculation out of the equation"